Ludwig Hauer (ri.) in front of his new work shop. Franz Hauer with his 1st front loader. From blacksmith to Austria's leading company - from a small blacksmith of 150m² up to premises with a size of 16.000m². In this section you find out about the most important mile stones of a successful history of developing products and structural extension. An own blacksmith is built in the size of 150 m² in Statzendorf 67. Franz Hauer starts with restructuring the blacksmith to an agricultural dealer and repairing service. Along with the extension of the company, the first steps of building rear loaders are made. The first Hauer front loader is manufactured. Johann Schopfhauser - the brother-in-law- becomes the first employee of the company. Building of a show-room with approx 150m². Development of a parkable front loader with a patented quick fastening and double eccentric bolt. Construction of the biggest production hall - approx. 765m². The second production hall is built. Franz Hauer becomes managing director of the company. The "Parallel-o-Matic" - a front loader with parallel guidance of implements - and the snow and levelling scoop "Terramatic" is presented. Further extensions of the office buidling. Front linkages are developed and taken into the product portfolio. A production facility with coating work places and a storage cellar with a size of approx. 6.500m² are built. Expansion of production area by another hall of a size of approx. 1.500m². Development and production start of rear levelling scraper. Hall number 6 is built with an area of 2.800m². Changing from a sole propriatorship to Franz Hauer GesmbH & CoKG. A land plot in Germany is bought. 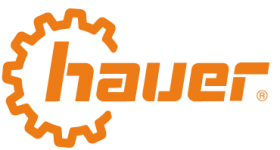 Hauer Frontlader GmbH in Malgersdorf in Germany is founded. Certification according to quality management system EN ISO 9001. A storage hall is built (approx. 2.500m²) with packing and delivery department. A new coating plant with an automatic transport function and a drying line is established. The whole assembly department gets newly organised in another hall. Hauer celebrates 50 years of front loader construction and starts with the new front loader series "POM-VX".